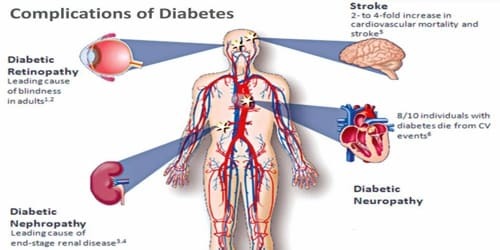 Definition: Diabetes mellitus (DM), commonly referred to as diabetes, is a chronic disease caused by inherited and/or acquired deficiency in the production of insulin by the pancreas, or by the ineffectiveness of the insulin produced. Symptoms of high blood sugar include frequent urination, increased thirst, and increased hunger. If left untreated, diabetes can cause many complications. Insulin is a hormone secreted by beta cells, which are located within clusters of cells in the pancreas called the islets of Langerhans. Insulin’s role in the body is to trigger cells to take up glucose so that the cells can use this energy-yielding sugar. Such a deficiency results in increased concentrations of glucose in the blood, which in turn damage many of the body’s systems, in particular, the blood vessels and nerves. As glucose accumulates in the blood, excess levels of this sugar are excreted in the urine. Because of greater amounts of glucose in the urine, more water is excreted with it, causing an increase in urinary volume and frequency of urination as well as thirst. Other symptoms of diabetes include itching, hunger, weight loss, and weakness. 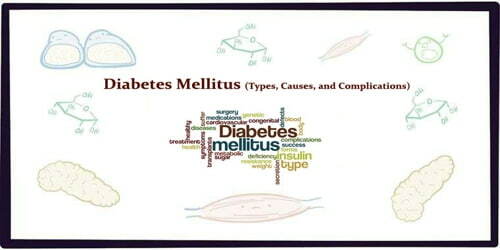 The name diabetes mellitus refers to these symptoms: diabetes, from the Greek diabainein, meaning “to pass through,” describes the copious urination, and mellitus, from the Latin meaning “sweetened with honey,” refers to sugar in the urine. Type 1 diabetes occurs because the insulin-producing cells of the pancreas (beta cells) are damaged. 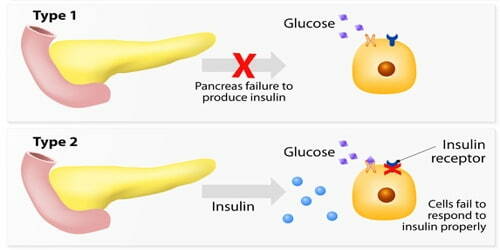 In Type 1 diabetes, the pancreas makes little or no insulin, so sugar cannot get into the body’s cells for use as energy. People with Type 1 diabetes must use insulin injections to control their blood glucose. Type 1 is the most common form of diabetes in people who are under age 30, but it can occur at any age. Ten percent of people with diabetes are diagnosed with Type 1. In Type 2 diabetes, the pancreas makes insulin, but it either doesn’t produce enough, or the insulin does not work properly. Nine out of 10 people with diabetes have Type 2. This type occurs most often in people who are over 40 years old and overweight. Type 2 diabetes may sometimes be controlled with a combination of diet, weight management, and exercise. However, treatment also may include oral glucose-lowering medications (taken by mouth) or insulin injections (shots). Gestational diabetes is the third main form and occurs when pregnant women without a previous history of diabetes develop high blood sugar levels. Strict metabolic control may reduce these risks to the level of those of non-diabetic expectant mothers. Gestational diabetes is diagnosed when blood glucose concentrations measure between 92 and 125 mg per 100 ml (5.1 and 6.9 millimoles [mmol] per liter) after fasting or when blood glucose concentrations equal or exceed 180 mg per 100 ml (10 mmol per liter) one hour after ingesting a glucose-rich solution. Prevention and treatment involve maintaining a healthy diet, regular physical exercise, a normal body weight, and avoiding the use of tobacco. Type 1 DM must be managed with insulin injections. Type 2 DM may be treated with medications with or without insulin. Insulin and some oral medications can cause low blood sugar. Weight loss surgery in those with obesity is sometimes an effective measure in those with type 2 DM. Gestational diabetes usually resolves after the birth of the baby. 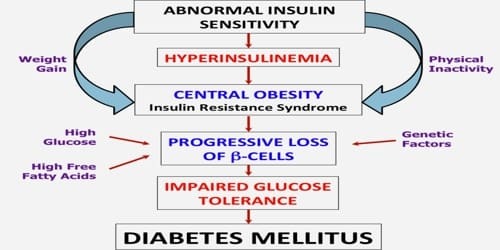 Causes and Risk factors of Diabetes Mellitus: Diabetes mellitus is classified into four broad categories: type 1, type 2, gestational diabetes, and “other specific types”. The “other specific types” are a collection of a few dozen individual causes. Diabetes is a more variable disease than once thought and people may have combinations of forms. Maturity-onset diabetes of the young (MODY) is a rare autosomal dominant inherited form of diabetes, due to one of several single-gene mutations causing defects in insulin production. It is significantly less common than the three main types. Prediabetes indicates a condition that occurs when a person’s blood glucose levels are higher than normal but not high enough for a diagnosis of type 2 DM. Many people who later develop type 2 DM spend many years in a state of prediabetes. Latent autoimmune diabetes of adults (LADA) is a condition in which type 1 DM develops in adults. Adults with LADA are frequently initially misdiagnosed as having type 2 DM, based on age rather than the cause. “Type 3 diabetes” has been suggested as a term for Alzheimer’s disease as the underlying processes may involve insulin resistance by the brain. History of gestational diabetes or delivery of a baby weighing more than 9 pounds (4.1 Kg). It is important to note that sugar itself does not cause diabetes. Eating a lot of sugar can lead to tooth decay, but it does not cause diabetes. Complications of Diabetes Mellitus: Diabetic retinopathy is a leading cause of blindness and visual disability. Diabetes mellitus is associated with damage to the small blood vessels in the retina, resulting in loss of vision. Loss of vision due to certain types of glaucoma and cataract may also be more common in people with diabetes than in those without the disease. The major long-term complications relate to damage to blood vessels. Diabetes doubles the risk of cardiovascular disease and about 75% of deaths in diabetics are due to coronary artery disease. Other macrovascular diseases include stroke and peripheral artery disease. Diabetes is among the leading causes of kidney failure, but its frequency varies between populations and is also related to the severity and duration of the disease. Several measures to slow down the progress of renal damage have been identified. They include control of high blood glucose, control of high blood pressure, intervention with medication in the early stage of kidney damage, and restriction of dietary protein. Damage to the nerves of the body, known as diabetic neuropathy, is the most common complication of diabetes. The symptoms can include numbness, tingling, pain, and altered pain sensation, which can lead to damage to the skin. Diabetes-related foot problems (such as diabetic foot ulcers) may occur and can be difficult to treat, occasionally requiring amputation. Additionally, proximal diabetic neuropathy causes painful muscle atrophy and weakness. Diabetic foot disease, due to changes in blood vessels and nerves, often leads to ulceration and subsequent limb amputation. It is one of the most costly complications of diabetes, especially in communities with inadequate footwear. It results from both vascular and neurological disease processes.